The German infinitive! Well, finally a part in German grammar which is easy and understandable you might think. Of course, the infinitive forms of German verbs are not too complicated. But there is a grammatical construction, where the German infinitive plays a more difficult role: The German infinitive clauses. Don’t worry, in the following we will try to clear up everything about this grammatical topic. Apart from that you should understand the high significance of this type of subordinate clauses. Well, they simply allow you to express yourself in a much more complex way. So, in the following, we will clear up what this type of German subordinate clause actually is. Furthermore, we will talk about its correct usage and the word order you apply in these sentences. Finally, we will have a detailed look on words and phrases that introduce this subordinate clause. Auf geht’s! 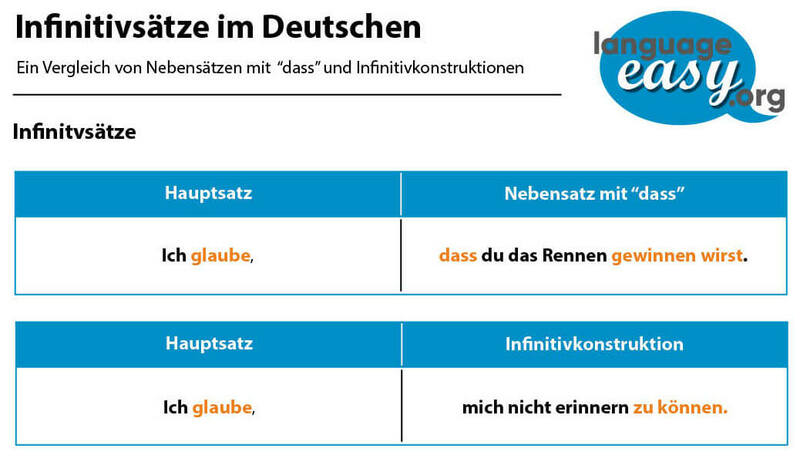 So, let’s come to the first point of this article an clear up what German infinitive clauses actually are. Take a look at the following description. German infinitive clauses are subordinate sentences which are constructed with the infinitive form of a verb and the preposition “zu”. Well, especially German infinitive clauses with the expression “um zu” represent the purpose of an action. Furthermore, there are certain phrases and verbs that introduce this type of subordinate clause. Of course, we will have a closer look on some lists of these expressions in the following. Now, let’s come to the correct usage of German infinitive clauses. 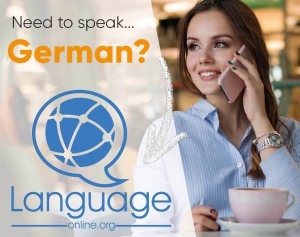 Well, in order to use this type of German subordinate clause in the correct way, I’d like to list up the most important points and give an example for every one. First, infinitive clauses can be used after certain words and phrases. “Er erlaubt ihr nicht, das Auto zu fahren.” – He doesn’t allow her to drive the car. Second, you should keep in mind that an infinitive clause normally follows a main sentence. But, in rare cases, it can also occur at the beginning of the main clause. “Ein intelligenter Mensch zu sein, ist nicht einfach..” – Being an intelligent human is not easy. Third, German infinitive clauses usually refer to the subject of the main sentence. “Sie muss erst lernen, Auto zu fahren.” – She still has to learn driving the car. Unfortunately it’s not that easy: Sometimes, German infinitive clauses refer to the object with certain verbs and phrases. “Er empfiehlt Ihnen, mehr zu lernen.” – I advise you to study harder. Finally, we use the term “um zu” to express the goal or the purpose of an action. Here, the German infinitive clause refers to the subejct. “Er hat so viel gelernt, um die Führerscheinprüfung zu bestehen.” -He has studied very hard to pass the drivers licence exam. So, I hope that the usage of this type of subordinate clause became clear. Now, let’s come to the word order in German infinitive clauses. Well, let’s come straight to the point. So, in order to construct German infinitive clauses, you can use the word “zu” with infinitive forms of the verb. You simply put these words at the end of the clause. As already mentioned above, the “um” of the expression “um zu” is placed at the beginning of the German infinitive clause. By the way, in the case of German separable verbs, “zu” is placed between the two parts of the verb. Well, I think that we have passed the most complicated parts of this article. By now, you should know the rules about German infinitive clauses. So, as promised, let’s list some verbs that introduce a infinitive clause in German. Finally, we will have a look at lists of verbs and phrases after which the German infinitive clause is normally used. Well, you will see that the infinitive clause can refer to the subject, the object or it can be an impersonal phrase. Here, we generally use the following adjectives with the impersonal form “es” (in the sense of one).